Low Vitamin D may affect your cancer risk and Vitamin D supplementation may play a role in preventing skin, colon, prostate and breast cancers. **Research studies to support these statements are ongoing. Nicotinamide is a critical component of our body’s defense system and has been shown in one study to help prevent skin cancers in patients with a history of skin cancer and may have other health benefits. Sun avoidance, sun protection, Vitamin D and Vitamin B3 (Nicotinamide), early detection, and proper treatment. There are medical studies that support the use of Nicotinamide in patients at risk for skin cancer. Patients at risk for skin cancer who stay out of the sun may become Vitamin D deficient, and Vitamin D is an important vitamin for bone health and studies are ongoing regarding additional health benefits. John K. Geisse M.D. is a board certified dermatologist, dermatopathologist, and fellowship trained Mohs micrographic surgeon. He has dedicated his career focused on diagnosing, treating and researching treatments for skin cancers. 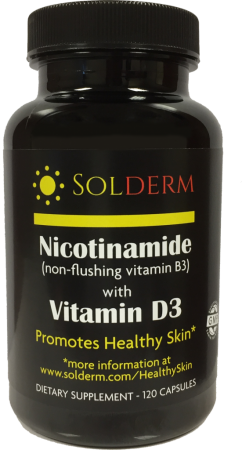 Get information on the benefits of Nicotinamide and Vitamin D3. Kyle J. Goleno PA-C is a surgical Physician Assistant. He has worked with Dr. Geisse for more than 15 years and has dedicated his career to skin cancer treatments and reconstructive surgery for skin cancer patients.